LGBTQ representation and visibility are more important than ever. Click the <<<image to ask your state senator to support SB 1670 – the LGBTQ Public Service Bill. 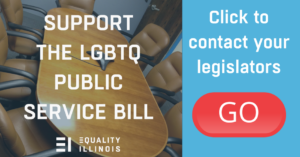 Sponsored by State Sen. Scott Bennett of Champaign, SB 1670 allows individuals applying for seats on state boards and commissions to self-identify as LGBTQ; applicants already self-identify their ethnicity, gender, and disability status. LGBTQ individuals who engage in public service can share our experiences and stories as LGBTQ people. That contributes to policies that are inclusive, affirming, and promote fairness.